Center for Poverty Reduction (CPRSPD), backed by the United Nations Development Program(UNDP), has estimated that Pakistan's poverty at national level declined sharply from 22.3 percent in 2005-06 (versus India's poverty rate of 42%) to 17.2 percent in 2007-08. Prior to this report, the 2009 UN Human and Income Poverty Report said the people living under $1.25 a day in India is 41.6 percent, about twice as much as Pakistan's 22.6 percent. The latest poverty estimate of 17.2% has been validated by the World Bank. The present government is facing real embarrassment on poverty estimates for 2007-08. The Panel of Economists, formed by the government in April 2008 under the leadership of Dr Hafiz Pasha, found that 35-40 percent people of Pakistan were living below the poverty line in 2007-08 – up from 22.3 percent in 2005-06. The political leadership, unaware of the technical details of the estimation techniques, took the estimates of the Panel seriously and everybody, including the ministers, the prime minister and the president started mentioning the numbers within and outside the country. The political leadership had no reason to distrust the professional skills of the Panel of Economists. Their only fault was that they could not realize that some members of the Panel of Economists were positioning themselves to get ministerial jobs and some retired "experts" were trying to secure their jobs in the government. These people could have moved their way to the present regime only if they would paint a bleak picture of the state of the economy, including the substantial rise in poverty. I am positive that this Panel of Economists has had no courage to write similar three paragraphs as documented in the Memorandum of Economic and Financial Policies attached with the Letter of Intent, signed by the Government of Pakistan on Nov 20, 2008 with the IMF. These three paragraphs, written by the present regime, very aptly summarize the major economic and social achievements of the last one decade, including the "reduction in poverty and an improvement in many social indicators." It appears that the Panel of Economists was trying to become more Christian than the Pope and as such came up with poverty estimates based on flawed methodology. On the other hand, the Centre for Poverty Reduction and Social Policy Development (CPRSPD), using the(Pakistan Social and Living Standards Measurement (PSLM) Survey 2007-08, also estimated poverty for the year 2007-08. 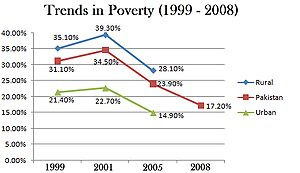 They found that poverty at national level declined sharply from 22.3 percent in 2005-06 to 17.2 percent in 2007-08. Poverty, both in rural and urban areas also registered sharp declines. The estimates of the CPRSPD were also validated by the experts from the World Bank. The "experts" from the Planning Commission are of the view that a sharp decline in poverty in 2007-08 does not depict the ground reality. Why should it depict the ground reality? Firstly, the period it covers is from July 2007 to June 2008. Secondly, poverty estimates are not like the growth number, money supply or inflation which change yearly. Poverty number reflects the changes in the lives of the people which are affected by the policies pursued for a fairly long period of time. To be fair to the government, how can they say now that the poverty in Pakistan has declined substantially in 2007-08 as opposed to their earlier stance that it had increased to the range of 35-40 percent? In other words, how can they say that at the time of taking charge of the state of affairs only 17.2 percent people were living below the poverty line and that there are indications that poverty is on the rise once again in Pakistan. This is indeed the real embarrassment for the government caused by the Panel of Economists. Poverty estimates are highly sensitive to changes in different variables. For example, should we use calorie intake or basic need approach or should we use 2550, 2250 or 2350 calorie to draw the poverty line? Should we use CPI, SPI, WPI or prices derived from the Survey itself to adjust the poverty line or should we use consumption or income? The basket of commodities may differ across researchers and even the cleaning protocol of data may give different poverty estimates. Thus, at any given point in time there can be different poverty estimates with same or different data sets. What is required, therefore, is that we continue to use the same methodology irrespective of its strength and weaknesses, lest we should never be able to know as to what is happening on poverty front. There are views about the methodology used by the Panel of Economists. One, that in the absence of PSLM Survey data for 2007-08 the Panel simply adjusted the poverty line upward to the extent of cumulative inflation (20 percent) for the period 2006-07 and 2007-08. On the other hand, they used household consumption expenditure for the year 2005-06, which was not adjusted upward to match the poverty line. In other words, apple was compared with orange. Naturally, such a flawed methodology was bound to produce erroneous results. Second, that the Panel used an equation to forecast poverty. This equation has many exogenous variables, such as food inflation, remittances, openness of trade, development expenditure as percentage of GDP, etc. Giving the value of each variable for 2007-08 and using the estimated parameters it predicted poverty for 2007-08. Forecasting is a complex exercise and requires transparency in the use of data. The Panel did not release those numbers which went into the model. Thirdly, they used the preliminary version of the model whose parameters changed substantially in subsequent revisions. The Panel never bothered to contact the author of the model. Had they contacted him, he could have saved the Panel from such disgrace. At the end, let me once again appeal to the Planning Commission to release the poverty numbers for 2007-08. Not releasing the number is not a good idea. The number is already out. Don't embarrass the government any more. Forget the Panel's report and trust your own young economists at the CPRSPD. Though it’s still early, it appears that Pakistan has begun to reap some of the benefits of the large talent pool created by 5X higher HEC funding, the creation of the high speed Internet and digital library etc. as part of the higher ed reform. Because of the robust economic growth in the last few years and the creation of millions of jobs, Pakistan’s poverty rate declined significantly (from 22% in 2005-06 to 17% in 2007-8, although poverty seems to be rising again in 2008-09) partly due to the FDI brought in to take advantage of the larger number of college grads. One of the ways Pakistani economy manages to stay afloat is by increasing remittances coming from overseas Pakistanis. According to the Nation newspaper, Pakistan received the highest-ever amount of over $7.811 billion as expatriate’s remittances in the recently concluded 2008-09 fiscal year (FY09), beating the previous record of $6.451 billion received in the preceding 2007-08 fiscal year (FY08). In FY09 workers’ remittances showed an increase of 21.08 percent, or $1.36 billion, when compared with FY08. The amount of $7.811 billion includes $0.48 million received through encashment and profit earned on Foreign Exchange Bearer Certificates (FEBCs) and Foreign Currency Bearer Certificates (FCBCs). The monthly average remittances in the period from July 2008 to June 2009 comes out to $650.95 million as compared to $537.60 million during the same corresponding period of the 2007-08 fiscal year, registering an increase of 21.08 percent. The inflow of remittances in the July 2008 to June 2009 period from USA, UAE, Saudi Arabia, GCC countries (including Bahrain, Kuwait, Qatar and Oman), UK and EU countries amounted to $1,735.87 million, $1,688.59 million, $1,559.56 million, $1,202.65 million, $605.69 million and $247.66 million respectively, as compared to $1,762.03 million, $1,090.30 million, $1,251.32 million, $983.39 million, $458.87 million and $176.64 million respectively, in the July 2007 to June 2008 period. Remittances received from Norway, Switzerland, Australia, Canada, Japan and other countries during FY09 amounted to $771.03 million as against $726.29 million in FY08. During the last month (June 2009), Pakistani workers remitted an amount of $735.17 million, up $187.76 million or 34.30 percent when compared with an amount of $547.41 million sent home in June 2008. The amount remitted in June 2009 is the second-highest received in a single month after $739.43 million sent home in March 2009. The inflow of remittances into Pakistan from most of the countries of the world increased last month as compared to June, 2008. According to the break up, remittances from UAE, USA, Saudi Arabia, GCC countries (including Bahrain, Kuwait, Qatar and Oman), UK and EU countries amounted to $164.70 million, $154.39 million, $152.33 million, $108.11 million, $68.48 million and $22.95m respectively, as compared to corresponding receipts from the respective countries during June, 2008 i.e. $88.29m, $143.57m, $123.67 million, $90.98m, $38.08m and $13.98m. Remittances received from Norway, Switzerland, Australia, Canada, Japan and other countries during June 2009 amounted to $64.19m compared to $48.80m during June 2008. Pakistan has moved 74 million people above poverty level and india has moved 113 million during the same period. Probably india was never on the favourable list of donor for the last sixty years and hence it has to mend for itself. Where as pakistan had the advantage of getting large aid from USA and oil rich countries of gcc. As of 2009 india is considered the important country to bail the world out of recession and not pakistan. On the contrary pakistan is looked upon as a rogue nuclear country. Can you provide links of the place which rated pakistan as a better place for outsourcing than india. Further i have visted gcc countries and they have outsourced their work more to the likes of wipro rather than any pakistani firm. Pls update the site with the list of pakistani bpo firm raking 1 billion dollar revenue. Anon: "Can you provide links of the place which rated pakistan as a better place for outsourcing than india." "Where as pakistan had the advantage of getting large aid from USA and oil rich countries of gcc." Anon: "As of 2009 india is considered the important country to bail the world out of recession and not pakistan. On the contrary pakistan is looked upon as a rogue nuclear country." Your charge about Pakistan as rogue is just your Indian propaganda. In real term how much foreign currency so called best service provider is earning per annum from the bpo / ites industry. India remittance of last year is around 45 billion usd. The Export revenues are estimated to gross USD 47.3 billion in FY2009, accounting for 66 per cent of the total IT-BPO industry revenues. While the US with a 60 per cent share remains the largest export market for Indian IT-BPO services, incremental growth is being driven by the European market, with UK and Continental Europe growing by a CAGR of 41.4 per cent and 51.4 per cent in the period FY2004-FY2008. Happy to know more about the number of pakistan and probably india could learn few for it follow where ever if required. India's population is seven time of pakistan and even if the IT earnins is made proportion it is 8.4 billion usd. Earning of india is around 44 billion usd. Finally any sensible business fellow will come to another country if the country has more peace and not peaces of bombs. Further the reason many firms opt for indian companies including usa is that they have gather and organized knowledge of thousand of people over a period of 10 years. Take for example wipro it has approximately 100,000 staff on board and they have build in approximately half million man years knowledge at its disposal. After knowledge is power. Further all will agree that the maintenance is more expensive then creating or buying and indians are only doing the maintenance. [sad part that india is yet to move to products ] Further that is the reason that the american fall has not affected the business to that extent. On googling i reached the site of worldbank where they have given the details about every economy and doing business with that country. Following url gives that of pakistan as of 2007. It has not been updated then. However the same is available for india as of 2009. It even gives statewise details. Above facts are self explanatory on the advantage of india compared to the other countries. India's GDP is only a third of China's GDP and there is growing gap in economic growth between the two, India has a lot more to worry about than just a few billions in IT exports from Bangalore. All of India's growth forecasts are based on the perfect scenarios where they assume they can continue to command the current share of the growing offshoring business. It can only happen if India has the quality of labor to fill the potential jobs while competing with many new players in the market who are hungrier for these jobs. There are a number of reports produced by McKinsey, Booz Allen, MIT and others on this subject that are available online. I came across this poem of conversation between the mountain and the squirrel and finally the fable. If I cannot carry forests on my back, Neither can you crack a nut." Another fantastic aspect is if the facts are against your perception you publish [ nice of you ] but no concept of acceptance. Unless a person or country accepts its weaknes it will never outgrow. India and pakistan are totally different in many aspect. Both has got its own SWOT. Leave india to its destiny see what is happening to pakistan and what can be done to improvise. proof of the pudding is eating. Remittance at 40 billion and software export at 40 billion is the truth of india and and 7 and 7 billion for pakistan. Hatred of pakistan towards india is no new and india has its own movement on positive direction inspite of the shortcomings. Anon: "proof of the pudding is eating. Remittance at 40 billion and software export at 40 billion is the truth of india and and 7 and 7 billion for pakistan." Do you know the ratio of populations in India and Pakistan? In 2008, 1,147 Million for India versus 172 million for Pakistan makes it 6.7 times more Indians than Pakistanis. Based on this ratio, India's remittances and exports should be 47 billion each, not 40 billion. Is that something to crow about? Anon: "While the US with a 60 per cent share remains the largest export market for Indian IT-BPO services, incremental growth is being driven by the European market, with UK and Continental Europe growing by a CAGR of 41.4 per cent and 51.4 per cent in the period FY2004-FY2008." When a bigoted India lover like Zakaria admits there is a problem in "peaceful, stable and prosperous" India, there must really be a serious problem. India accounts for 65% of all IT work performed offshore. This is largely thanks to its seemingly limitless supply of low-cost engineers and other professionals. Yet, not all is as it seems. India produces 400,000 engineering graduates a year (five times as many as the United States) and a stunning 2.5 million university graduates overall. Yet only about a quarter of India's college graduates are up to snuff. The odds at top Indian companies are even worse. Some 1.3 million people applied to tech-services giant Infosys last year. Fewer than 2% of those were employable. Graduates of non-elite schools suffer from weak English skills. The quality of faculty and courses is sub-par. In-house training programs for new recruits at top Indian IT services firms such as Infosys (INFY), Genpact, and Tata Consultancy Services fill some of the gaps. But by 2010, India will have a shortfall of 150,000 IT engineers and 350,000 business-process staff. Meanwhile, India's GDP is only a third of China's GDP and there is growing gap in economic growth between the two, India has a lot more to worry about than just a few billions in IT exports from Bangalore. is 0.855% more than india. You can correct the exact maths and that will tell very clearly where pakistan stands in the ITES export. India is 1/3 the size of china with 15% less to china in population and nearly 41% the gdp of china. Pakistan is 1/4 the size of india with 15% population of india and its gdp is 12% of india. pak $427.3 billion (2008 est.)" All the remittance numbers are in real dollars, not PPP dollars. Jaisalmer: In the past four years, some 5,000 Hindus may have crossed over from Pakistan, never to return. It has not been easy, abandoning their homes, sometimes even their families, but they say they had no choice: they had to flee the Taliban. It started as a trickle in 2006, the year the Thar Express was flagged off. The weekly train starts from Karachi ,enters India at Munabaoa border town in Barmerand runs up to Jodhpur. In the first year itself, 392 Hindus crossed over. This grew to 880 in 2007. Last year, the number was 1,240, and this year, till August, over 1,000 have crossed over and not gone back.They keep extending their visas and hope to become Indian citizens. Ranaram, who used to live in the Rahimyar district of Pakistans Punjab , says he fell prey to the Taliban. His wife was kidnapped, raped and forcibly converted to Islam. His two daughters were also forcibly converted . Ranaram, too, had to accept Islam for fear of his life. He thought it best to flee with his two daughters after his wife was untraceable. Dungaram, another migrant, says the atrocity against Hindus in Pakistan has increased in the past two years after the ouster of Pervez Musharraf. Fanatics have become very active... We were not entitled to permanent jobs unless we converted to Islam. Hindu Singh Sodha, president of the Seemant Lok Sangathan (SLS)a group working for the refugees in Barmer and Jaisalmersays theres unfortunately no proper refugee policy in India even though people from Pakistan reach here in large numbers. The government of India has rarely raised the issue of atrocities against Hindus during the bilateral talks with Pakistan, said Sodha. He said in 2004-05 , over 135 families were given Indian citizenship but the rest were still living illegally in the country and were often tortured by police because they didnt have proper citizenship certificates. In December 2008, over 200 Hindus were converted to Islam in Mirpur Khas town of Pakistan. But there are several others who want to stick to their religion but theres no safety for them in Pakistan, he added. Bangalore: EMC Corp on Wednesday announced a $1.5 billion investment in India over the next five years, marking a big bright spot in the IT sector that has been one of the most badly hit by the global recession. Company CFO David Goulden, who made the announcement in Bangalore, said the investment represents a three-fold increase over the investment made by EMC in India over the previous five years. The information infrastructure company has invested $500 million between 2006 and now, mostly in Bangalore. This is the largest investment that we have committed outside the US, Goulden said. The new investments will go into three areas: expanding R&D infrastructure at the centre of excellence (CoE) in Bangalore; increasing EMC Global Services capabilities at the CoE; and adding more technologists to drive deeper levels of engagement and support for local customers and partners. On Wednesday, the company inaugurated a new 4.95-lakh sqft facility on the outer ring road near Marathahalli that will not only bring together operations that currently function out of four separate locations but also create additional space. It has the capacity to seat 3,500 people. EMC India currently has a little over 2,000 employees. In a measure of the importance EMC attaches to its India operations, Goulden was accompanied in his visit to Bangalore by Sanjay Mirchandani , chief information officer, Mark Sorenson, senior VP (storage software group), Jack Mollen, head of HR, Gary Baty, VP (HR) for Asia-Pacific & Japan, Steve Leonard, president of Asia-Pacific & Japan, and John Herrera, VP in the office of globalisation. EMC focusses on next generation virtualised data centres, cloud computing, virtualised desktops and clients, and next generation backup, recovery and archive solutions. I came across this appeal. It is worth for anybody to contribute irrespective of nationalities. He (Shaukat Tarin) was also asked why the government has not included the 17.2 per cent poverty figure of 2007-08 worked out by the Centre for the Poverty Reduction and Social Policy Development (CPRSPD) and validated by the World Bank. In response, Tarin said that while the WB has validated the 17.2 per cent poverty figure there are indications that in the last quarter of 2007-08, poverty surged and we have initiated the rapid survey to this effect which would come up with a final poverty figure after a three-month period. However, he said that estimates are that the poverty figure would stand at over 30 per cent during the last fiscal year. He also argued that people are committing suicide and selling their kids because of poverty, so obviously the poverty figure of 17.2 per cent needed to be closer to reality. The government has missed virtually every main macro-economic target set in the budget 2008-09 for the outgoing fiscal. This includes the projected 5.5 per cent GDP growth, 12 per cent inflation, Rs1,250 billion revenue and per capita income of 1,085 dollars, reveals the Economic Survey for 2008-09 released here by Adviser to Prime Minister on Finance Shaukat Tarin. The survey states that Pakistan’s GDP growth has been estimated at 2 per cent for the current fiscal as against the original 5.5 per cent target, which was then revised to 3.5 per cent and further clipped to 2.5 per cent as agreed with the IMF. Likewise, the inflation target was fixed at 12 per cent by the government in the budget for the current fiscal, which in reality stood at 22.3 per cent in the first 10 months of 2008-09. “Per capita income in dollar terms rose from the finalised figure of $1,042 last year to $1,046 in 2008-09, showing a marginal increase of 0.3 per cent.” However, in last year’s Economic Survey the target of per capita income was $1,085, which has come down to $1,042. The revenue target was fixed in the budget at Rs1,250 billion and was irrationally revised upward by the government to Rs1,360 billion, then revised downwards to Rs1,300 billion and yet again reduced to Rs1,180 billion, which also seems impossible to achieve. However, Adviser to Prime Minister on Finance Shaukat Tarin said during a press conference here on Thursday that the country’s real GDP grew by 2 per cent in 2008-09 against a target of 4.1 per cent. He said that the 2 per cent economic growth was a result of four shocks, which include macro-economic imbalances, external trade shocks, the global economic crisis and domestic security issues. He mentioned that when the present government took charge, Pakistan’s balance of payments, current account deficit and trade deficit were in the danger zone, but have now improved after joining the IMF programme. He said that the government had consolidated the economy in the current fiscal and was now ready for a growth-oriented budget to be announced on June 13. Even in india the gap between the rich and the poor is increase or even the middle class and the poor is increasing. However manmohan singh has tried to help the rural mass through the loan waiver and other scheme of 100 days compulsory employment through government work. Flip side is the corruption as these money invariably goes to the pockets of the political party. ONly solution is the education and the individual could mind their businss and the dependence on the government comes down. Anon: "Even in india the gap between the rich and the poor is increase or even the middle class and the poor is increasing." According to the new UN-HABITAT report on the State of the World's Cities 2008/9: Harmonious Cities, China has the highest level of consumption inequality based on Gini Coefficient in the Asia region, higher than Pakistan (0.298), Bangladesh (0.318), India (0.325), and Indonesia (0.343), among others." Gini coefficient is defined as a ratio with values between 0 and 1: A low Gini coefficient indicates more equal income or wealth distribution, while a high Gini coefficient indicates more unequal distribution. 0 corresponds to perfect equality (everyone having exactly the same income) and 1 corresponds to perfect inequality (where one person has all the income, while everyone else has zero income). However this has increased the double earning and required for house maid and deployment of unskilled labour who are getting good income compared to earlier days. India is condemning another generation to brain damage, poor education and early death by failing to meet its targets for tackling the malnutrition that affects almost half of its children, a study backed by the British Government concluded yesterday. The country is an “economic powerhouse but a nutritional weakling”, said the report by the British-based Institute of Development Studies (IDS), which incorporated papers by more than 20 India analysts. It said that despite India’s recent economic boom, at least 46 per cent of children up to the age of 3 still suffer from malnutrition, making the country home to a third of the world’s malnourished children. The UN defines malnutrition as a state in which an individual can no longer maintain natural bodily capacities such as growth, pregnancy, lactation, learning abilities, physical work and resisting and recovering from disease. In 2001, India committed to the UN Millennium Development Goal of halving its number of hungry by 2015. China has already met its target. India, though, will not meet its goal until 2043, based on its current rate of progress, the IDS report concluded. “It’s the contrast between India’s fantastic economic growth and its persistent malnutrition which is so shocking,” Lawrence Haddad, director of the IDS, told The Times. He said that an average of 6,000 children died every day in India; 2,000-3,000 of them from malnutrition. BBC website has a pictorial today of charities feeding the poor. One picture shows the big kitchen of one charity alone that feeds 40,000 people every day in Karachi. ISLAMABAD: While publicly it criticizes former President Musharraf for the present economic mess, the government in its official documents has appreciated the economic policies of the previous regime that became a strong base for seeking loans from multilateral donors and friends of Pakistan. The PPP-led coalition partners have been blaming Musharraf regime in public speeches for fudging economic figures to paint a rosy picture, while its overall policies pushed the country into economic crisis. The letter of intent (LoI), on the basis of which, Pakistan sought the much-needed $7.6 billion bailout package from the International Monitory Fund (IMF), has bit by bit appreciated the Musharraf policies since 2000. During the past one decade (1999-2007), the LoI says Pakistan’s economy witnessed a major economic transformation from substantial increase in the volume of gross domestic product (GDP) to greater international trade. Talking to Dawn on Thursday former Finance Minister Ishaq Dar said whatever he said about the health of economy was based on the balance sheet existed on March 31, 2008. He said the balance sheet was dully approved by the then cabinet headed by Prime Minister Syed Yousuf Raza Gilani. He said no body denied the contents of the balance sheet. The focus of the previous economic policy was on promotion of consumerism without supporting the industrial base. Apparently not willing to agree with the LoI contents, he said though he has a different view of the past economic growth but quickly added the same was destroyed in the last 15 months of the military led dictator. An official source requesting not to be named said the economic wizards in the finance ministry are not politicians to make only speeches but they have to look into ground realities. ‘We reported to IMF whatever is factual and based on evidence,’ the official added. The LoI said the country’s real GDP increased from $60 billion in 2000-01 to $170 billion in 2007-08 with per capital income rising from under $500 to over $1000. During the same period, the volume of international trade increased to nearly $60 billion from $20 billion. For most of this period, real GDP grew at more than 7 per cent a year with relative price stability. The improved macroeconomic performance enabled Pakistan to re-enter the international capital markets in the mid-2000s. Buoyant output growth, low inflation, and the government’s social policies contributed to a reduction in poverty and an improvement in many social indicators. Former Finance Minister Dr Salman Shah told this scribe the government has made the 170 million people fool while telling them pack of lies in the past nine months about the economic policies of the Mushrraf regime. He said that as the present government acknowledged in black and white, the impressive past growth made their way easier to make access to the new facility of the IMF for emerging markets hit by the crisis to support the balance of payment problems. Had growth not been achieved, Pakistan would have to apply for other long term IMF financing facilities like poverty reduction, structural adjustments etc, Shah said adding government should tell truth to the nation if they have confidence. ‘The recruitment made so far for running the finances of this country is very depressing. This shows this government has neither commitment nor capabilities to take the country out of the current crisis,’ Dr Salman said. ISLAMABAD (February 25 2010): The biggest challenge Pakistan facing now is to improve growth rate to over 5 percent on sustained basis by overcoming structural challenges, says an IMF official. "There is no reason Pakistan can not grow over five percent on sustained basis by increasing exports and investments; all opportunities are there", said Masood Ahmed, IMF Director of Middle Eastern and Central Asian Division, in an exclusive interview with Business Recorder. "To do so, Pakistan has to address impediments of increasing investment and to provide infrastructure, educated and skilled human capital, improve business environment, and level of governance", he said. "But in three to five years Pakistan, strongly growing on the structural reforms path, can also catch a growth rate of 8 percent, equal to its Asian rivals. That is also an average growth rate of Asia next year," he added. Masood called for national consensus among all political parties on structural reforms so that in future these reforms should stay on course, and growth pattern should not be that much disturbed, and the government should show more political will in implementing these reforms. "Pakistan needs tough political decision to take on reforming its commercial entities, cutting its losses", Masood said. Good macroeconomic practices to ensure strong pubic finances and competitive exchange rate to bolster high growth are also essential, he added. Pakistan grew 2 percent last year; has estimated to grow at 3 percent this year; and the Fund forecast to get to 4 percent next year. Unlike previous years' growth, based on consumption, future growth should be based on exports and investments. In a scenario of growing global growth at 4 percent from negative 1 percent last year, exports demand would grow and competitive price advantage would support local exporters, making up for modest growth this year. "But, this is not enough, and Pakistan can achieve 8 percent of growth in coming years if structural reforms are really undertaken," the IMF Director said. Pakistan government can save up to 8.5 percent of GDP to deploy from increasing tax revenue, and reduce losses of public sector inefficient enterprises. "Resources that are currently wasted in the loss, making public enterprises and taxes that are collecting taxes that are not collected, making public spending more efficient are estimated by Finance Ministry is over 8 percent of GDP which are almost $12 billion", says Masood, quoting Finance Ministry reports. These resources could be deployed to finance the much-needed infrastructure, reliable electricity provision, better health and education for millions of Pakistanis, he added. Among other challenges, international oil prices can augment again next year posing balance of payments problems and inflation which had once come down to 9 percent. He said the government should also be reducing fiscal deficit, which is around 5 percent this year, that would crowed out private sector borrowing from banking sector. "Inflation, once reduced to around 9 percent, is now again increasing, and rebounding at 13 percent, which is very harmful for the poor segment of the society. This is the biggest help for the poor class; this also helps increase investment, that ultimately helps reducing poverty," Masood said. He said help from donors, like Tokyo pledges, are slow, and IMF urges the donors to come up and support Pakistan, he added. Pakistan is more urbanized with a larger middle class than India as percent of population. In 2007, Standard Chartered Bank analysts and SBP estimated there were 30 to 35 million Pakistanis earning more than $10,000 a year. Of these, about 17 million are in the upper and upper middle class, according to a recent report. As to India's much hyped middle class, a new report by Nancy Birdsall of Center for Global Development says it is a myth. She has proposed a new definition of the middle class for developing countries in a forthcoming World Bank publication, Equity in a Globalizing World. Birdsall defines the middle class in the developing world to include people with an income above $10 day, but excluding the top 5% of that country. By this definition, India even urban India alone has no middle class; everyone at over $10 a day is in the top 5% of the country. This is a combination both of the depth of India's poverty and its inequality. China had no middle class in 1990, but by 2005, had a small urban middle class (3% of the population). South Africa (7%), Russia (30%) and Brazil (19%) all had sizable middle classes in 2005.